Festival ready? Living life on the edge? This fringe bootie magically masters the art of retro and of-the-moment style with a hint of rebellion. Wear them with leggings, your bohemian frocks and all those shorts and overalls ... from the dog days of summer to the first sign of frost. 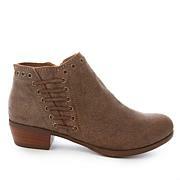 I am very happy with these ankle boots. They ran a little loose on me, but you can always put a sock on. I like them. Great price!love materials of this piece! The grey suede matches my minnetonka hat.which is. Also fabulous.bought 6.5 and I am a wide foot .perfect fit roomy glad I didn't do a 7 because it would be too big.plenty of room and feels great on .easy to get into. 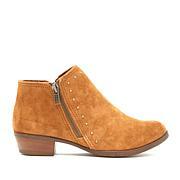 I recently received these booties and I love the style and comfort. I would certainly order another pair by this same company. I almost felt like Peter Pan because they are a bit long like 1/2 size longer they are also a bit wide. I ordered my normal size which is an 8 and they are roomier than a usual 8 plus i can fit my orthotics in with no problem.They are adorable and fun. But, NO arch support what so ever. I am surprised that more people haven't bought the taupe. It's a great color. These are comfortable. True to size. The fringe just adds to these booties. 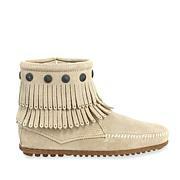 Minnetonka prides itself on quality, comfort and value. 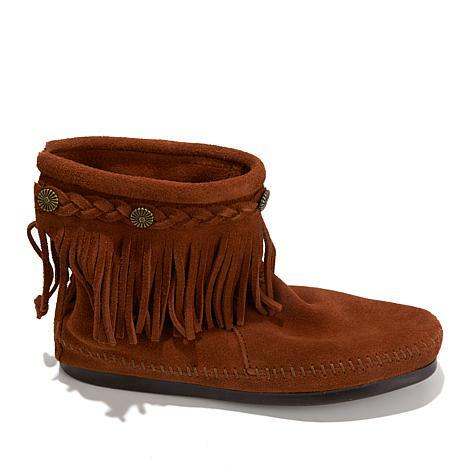 The leather used in their moccasins, slippers, sandals and hats are by-products of the food industry. Each and every detail is a tribute to their roots in traditional moccasin footwear, with accents like fringe, beading and embroidery constructed to stand the test of time.